An overload of kale due to a shopping error has meant that I’ve had to think of numerous ways to use it up. I came across a recipe for kale and chickpea curry tonight ( http://www.harighotra.co.uk/kale-and-chickpea-curry-recipe ) and decided to give it a try. As usual however, I didn’t have quite the right ingredients – no chickpeas for a start. What’s more, I prefer my curries slightly milder than this recipe suggests. Heat the oil in a lidded pan until it is hot. Add the mustard and cumin seeds, which will begin to pop. Stir quickly and replace the lid. Take care not to let them burn by stirring every 20 seconds or so, but allow them to pop with the lid on. This will take a minute or two. Add the onion and turn down the heat. Allow it to cook, stirring regularly to ensure it doesn’t stick or burn, until it turns golden. Add the garlic, stir and cook briefly. Add the tomato, the crushed coriander seeds and all the other spices (turmeric, hot chilli powder, mild chilli powder, madras curry powder) allow the mixture to cook gently with the lid on until it thickens up. This will probably take about 10 minutes. Stir in the chopped kale in batches allowing it to cook and reduce in size before adding the next lot. 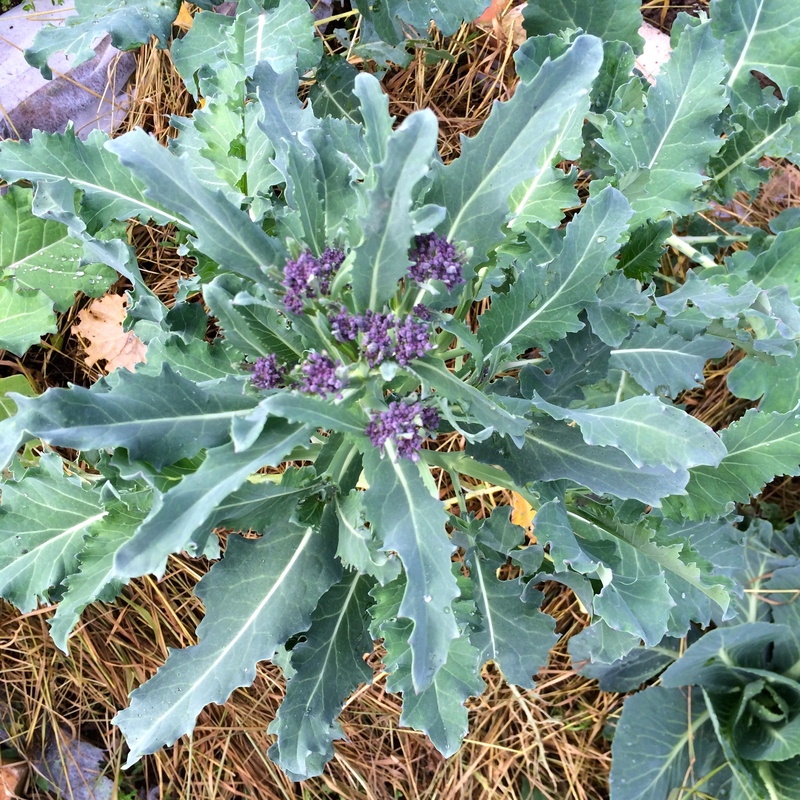 Cook the kale to your preference – the longer you cook it the softer it will be. Ours still had some bite, which I think gave some variety of texture to the dish. Serve, generously sprinkeld with fresh chopped coriander, either with rice or flat breads. This would be very nice with some cucumber raitia. I thought it was surprisingly tangy, almost as it it had had a touch of lemon or lime added. I have been tracking my diet using the popular ‘My Fitness Pal’ app. Here are the nutritional values for this recipe, according to the app. A case file is being prepared by the Attendance and Welfare department at my local council because I chose to take my children on holiday in term-time and refused to pay the fixed penalty notice that they served me with. Should the legal department choose to go ahead and prosecute me, I could be fined up to £2000 or in the worst possible case given a custodial sentence. Needless to say, I am very, very angry and I would like to explain why. If you are reading this and you are in a similar situation please remember that the views I am going to express are not those of a legal expert. If I know something to be a fact I will try to make that clear, likewise, if I am simply expression an opinion, I will also try to make that clear. It is very important to distinguish between the two. The critical part of this clause is the use of the word regularly. If my children are absent from school for a week but have 100% attendance for the rest of the academic year, is that regular attendance? In the well-publicised case of Jon Platt and the Isle of Wight Council, both the local magistrates and the High court agreed that a family holiday, taken in term-time could not be considered to make a child’s attendance ‘irregular’. They agreed that the child’s attendance should be considered over the whole academic year, not just over the period of one week when they were away. A benchmark of 90% attendance was considered to constitute ‘regular attendance’. So why are so many parents being issued with ‘fines’ or ‘fixed penalty notices’ as they are more properly known (strictly they are not fines, the courts issue those)? First of all, it is important to know that if you have been issued with a fixed penalty notice (FPN) it is because the Head Teacher of your children’s school has referred the matter to the council and asked them to go ahead and issue one. It is quite possible for children who are on holiday to be marked on the register with an unauthorised absence but the Head Teacher DOES NOT have to ask for a FPN to be served. In many ways this is sensible – it allows Head Teachers to show some common sense and humanity. There are many families who have no choice about when they can take a holiday from work due to the regulations of their employer. Some families have (other) children with special needs who cannot cope with the crowds that holidays outside of term time bring. Perhaps a family wedding has been arranged overseas? I would hope that head teachers would not stand in the way of families attending. There are examples of Head Teachers up and down the land taking the time to understand the needs of children and families in their school and making allowances for absence during term time. But there have been some Head teachers who have shown no sympathy whatsoever. I would like to make it clear that I am not applying this to the head teacher at my children’s school who I know has been helpful to families who need time off. But back to the question, why are so many FPN’s being served? Most parents remember a time when schools were relaxed about term-time holidays. Since our school days, the Department of Education has changed the guidelines it issues to Heads. Where once, Heads could authorise family holidays, they are now directed to authorise them only in ‘exceptional circumstances’. How a head teacher interprets that can vary widely from school to school. And, as we have already seen, an unauthorised absence does not necessarily result in a FPN. So what is the benefit of issuing a FPN? It would seem to me that the main aim is to deter parents from taking term-time holidays and you might consider that a worthy aim. I will address that point later on. You might agree with the Department of Education’s view that ‘every school day counts’ (I happen to disagree strongly, but again, more on that later). You may even agree with the way that OFSTED use attendance to judge a school. Schools will never achieve an ‘outstanding’ judgment unless their attendance figures are relatively high. I cannot tell you that this is factually true or even what level of attendance would be required but I can tell you that that is what a local school governor told me. Head Teachers who want their schools to be rated ‘outstanding’ (and show me one who doesn’t) need to get the attendance of pupils up. So, I ask you, is attendance about improving educational standards, or improving an OFSTED rating? You can decide which is more important to you. You may believe that one flows from the other. I don’t. The cynical view of FPN’s is that they are a good way to squeeze a bit more cash from otherwise decent, law-abiding citizens. I have no idea if councils actually end up making any profits from them but one thing is for sure, the cash raised does not go directly to schools. One thing is for sure, many, many parents will simply pay the FPN and accept it as a worthwhile price to pay for a holiday when it suits them. If I had done that, it would have been financially, completely worth it. So why didn’t I just pay? When you pay the FPN you are admitting to an offence and you may be asked to disclose it if you apply for a job. Fixed penalty notices were originally introduced by the Labour government, in 2003 as part of the Anti-Social Behavior Act. They were a way of quickly dealing with anti-social behavior without going to court. You could simply accept you were guilty of a crime, pay the ‘fine’ and avoid the expense (to the taxpayer) of court. The legislation was drafted so that it could be applied in the case of school absence, but it is unlikely that it was intended to be used against anyone other than persistent truants. I simply believe, like Jon Platt, that I have NOT committed any offense. Looked at over the course of an academic year, rather than one week, my children have very good attendance. Having got the facts (as I understand them) out of the way, I would like to tell you about my case. I have three children all in the same primary school. They are in year 6, year 4 and reception. In this academic year, my eldest and youngest children have each had two days off sick, in line with the school’s policy of not bringing children in who have been exposed to vomiting or diarrhea. My eldest son has had a total of three and a half days off due to medical appointments in a city 45 minutes drive away. This is because he was treated for childhood leukaemia between the ages of 3 and 6. We do not choose for his appointments to be in term-time or in a hospital far from our home. Neither do we enjoy waiting up to two hours each time to see his consultant, a very busy man, whose schedule can be disrupted instantly if a very sick child is admitted. These absences are beyond our control. My daughter has had no time off at all, other than our holiday. My children are very well behaved, mostly achieving at or above the expected level and are very happy at school. The only exception is my eldest son who has specific learning difficulties with spelling. It IS likely his attendance in the early years, while he was coping with cancer, has had a serious impact on this. After all, I seem to remember that in Reception, his attendance may have been as low as 65% and I think it was just over 80% in year 1. No school attendance officer or school nurse offered us any support at that time. He is, however performing well in numeracy and I have paid a LOT of money to take him to a private tutor to help his literacy. Do I sound like someone who deserves to be prosecuted for failing to ensure a good and regular education for my children. Up until February of this year, we had NEVER taken the children out of school. Not for a single day. My children have always had very simple caravan holidays in the UK because that is what we could afford and we were quite happy about that. I’m not really massively in favour of taking children out of school. But this year I got a bit emotionally involved in the idea of an overseas holiday. Early in the academic year, our school proposed to take Year 6 children to France (Calais to be precise). If I remember correctly, they would have gone by bus on a Monday in the middle of May and returned the following Friday. We live in the North-East of England so accounting for the travelling time, that would mean they would have had approximately 3 days in the Calais environs (which is barely France if you ask me). The trip would have cost about £450. This proposal hit a very raw nerve. I had never been able to afford the joy of taking my children overseas. Firstly because when you have a child on cancer treatment, it is not a good idea to take them more than a few hours travelling time from their hospital. If your child has the kind of leukaemia my son had, that means you aren’t going to be going very far for 3 years. So, until he was 6 and in year 2 at school, we couldn’t really go far, even if we wanted to. Following that, I didn’t take the children out of school because I was happy to teach them that we were living within our means and doing the right thing with regard to the importance of schooling. But when the school proposed an overseas trip, I felt cheated. It may be stupid, but I still feel emotional about it now. I wanted to be the one to introduce my child to foreign travel and the excitement that that brings. I wanted to be able to share that with him and if I could travel in term-time, I would be able to afford it. For the £450 it would cost for the school trip, our whole family could have rented a caravan in France. Perhaps that was selfish of me and I should have seen the trip as an opportunity for him but I made my choice and wouldn’t let him go. I went to school and talked to the deputy head. Stupidly, I couldn’t control my emotions when I spoke to her and told her that if the trip went ahead I would take my children overseas myself, regardless of whether the absence was authorised or not. I was assured that the absence WOULD NOT be authorised. This is the point when I started to feel that the system was wrong. How can it be ok for a school to remove children for an overseas trip, but a parent cannot? Ah, but I hear you cry, a school trip is educational. Well, yes, it may well be, but so might a family holiday. Would it not be educational to spend a week in London, seeing the sights and discussing their relevance to our history and culture? I would argue that ANY family holiday is educational in some way or other, even a week on the beach at Bognor, And I’m not the only one. Psychologists have looked at the effect of quality family-time on the brain and surprise, surprise, it turns out that holidays are good because they have the effect of ‘resetting’ the brain in a way that primes them for learning. I was offered the opportunity to take my family skiing for a week. The trip was to be paid for my Mum, who was as excited as me to be able to give the children such an experience. It was a very expensive holiday but had we taken it the following week, it would have been almost double. If you are in any doubt about how expensive a week skiing is, self-catering, for 6 people, in France, in half term, just Google it. It’s a LOT! There’s a reason why skiing tends to be the preserve of the privileged. I offered no explanation to the school as to why I was taking the holiday when I did, other than on the grounds of cost. I should probably have lied and said it was the only time my husband could get time off. But I am not generally a liar and quite frankly, I didn’t think I should HAVE to justify myself. I, as the one with parental responsibility made a judgment that a week learning to ski, being exposed to a new sport, environment and language was a good use of my children’s time. It would seem that my local secondary schools are both of the same opinion. They both offer skiing trips of the same duration, in term time. I can only assume that they don’t request fixed penalty notices to be issued to the families of all the children that go. The Department for Education has published research that shows the impact of absence from school on attainment at the end of Key Stage 2. Of course it concludes that lower attendance is accompanied by lower attainment. However, when it is broken down according to the reason for the absence, a different picture emerges. The rate of attainment stays about the same at around 75% of pupils achieving level 4 or over, regardless of whether they have missed up to 20% (yes, 20%!) of sessions, when it is due to family holidays. For all other reasons, including authorised absences, attainment drops down. The main contributing factors that reduce attainment are when children are excluded or if they are missing school as a result of being part of the travelling community. What I would draw from this is that family holidays do not impact adversely on learning. I might even be so bold as to say that the value parents place on education is a much stronger indicator of likely pupil attainment, than absence. Parents having the right to choose what is best for their children. The fact that legislation is being used for a purpose other than which was originally intended. Use of FPN’s in this way discriminates against children from poorer households who will find it difficult to access a family holiday other than in term time. It also bothers me that I now feel relatively victimised by the Head Teacher at my children’s school. I know that not all family holidays have been referred for a FPN. Whilst I am pleased for the families that haven’t had this stress and I know that they had good (though not ‘exceptional’) reasons for their holidays, it leaves a very bitter taste in the mouth. If you agree with my views and wish the government to think again about how FPN’s are being used to criminalise parents, I suggest you take a look at this Facebook page https://www.facebook.com/schoolfinesrefund/ and consider supporting Jon Platt’s continuing fight with a small financial contribution. N.B. I wrote this piece back in June. At the time I was feeling extremely cross about the situation I was in. I have since heard that I will not be prosecuted, but that is (probably) only because under section 123 of Magistrates Court Act the council have 6 months to institute proceedings from date of the offence. Should I be referred for another FPN, there is a good chance I could have proceedings instigated against me in court. 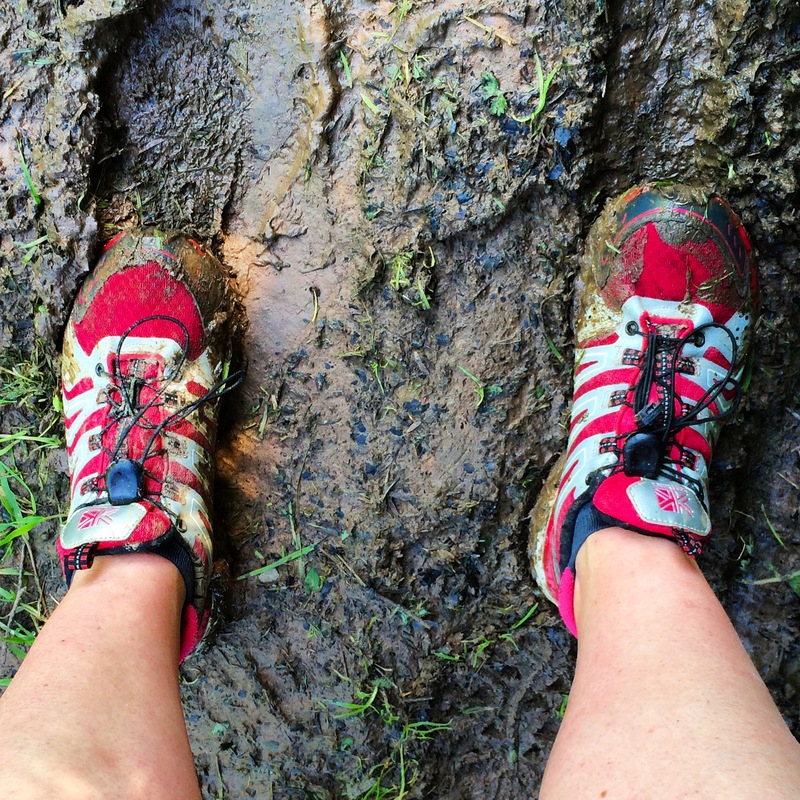 Running – I don’t love it, but…. …I get to spend half an hour or so with my favourite tunes blasting into my ears. Listening to my iPod can transport me back to being a teenager again, which is guaranteed to make me feel good. …I love the fact that I could outpace my teenage self! I couldn’t run 5km when I was 16. 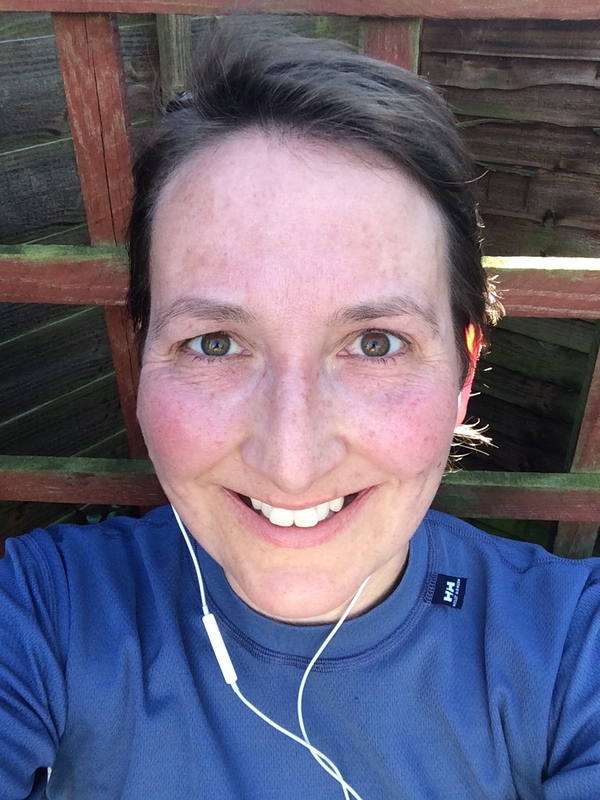 …when I run past people, they don’t know if I’ve been out running for 5 miles or 5 minutes! I can pretend to be Paula Radcliffe. …I’m setting an example for my children. …I’m doing what I can to stay healthy. Running/jogging/brisk walking for half an hour, three times a week will not only help to keep my weight manageable, and therefore reduce my risk of diabetes and cancer but will keep my cardiovascular system in good condition too. Weight bearing exercise is also good for keeping the bones strong and reducing the risk of osteoporosis. …exercising outdoors is good for the soul. I watch the seasons change through the blooming of the hedgerows. 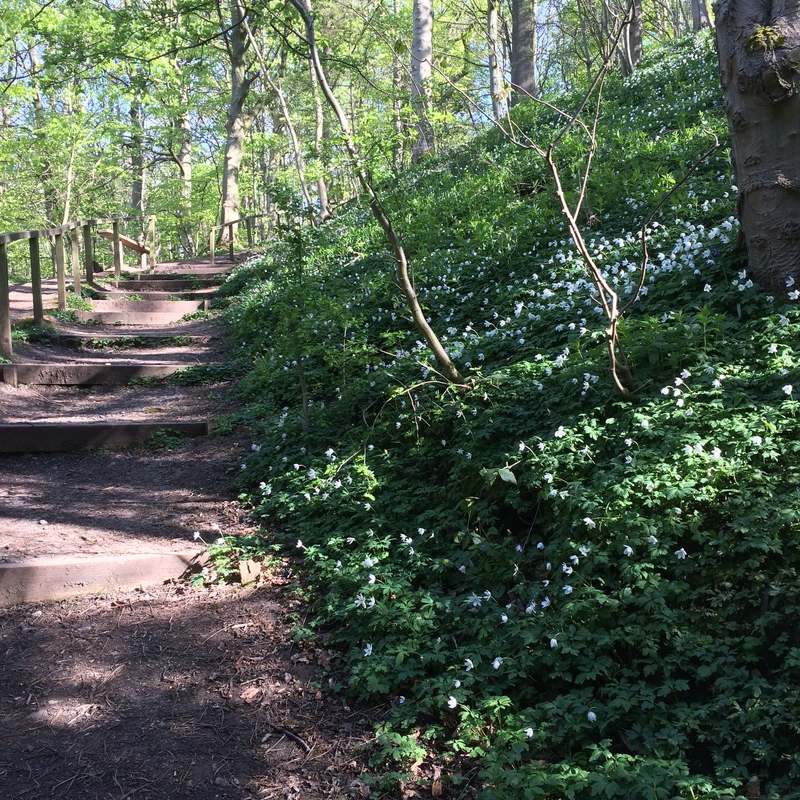 Sometimes I’ve got to go in search of a nice woodland trail to get a hit of bluebells or wild garlic in flower but I’m just as happy running through the neighbourhood and enjoying the gardens change from snowdrops to daffodils to roses. …it costs me nothing but time. This can be a bit of clincher. There’s no doubt that I’ve made time to do this now that my youngest is at nursery and I know it’ll be even easier when September comes and he’s at school full time. I take my hat off to all you working parents who fit your exercise in around other commitments. …it’s taught me that commitment works. Why has it taken me 40 years to get a better understanding of this? …if I want to stick at training, I need a target. My motivation is limited otherwise. Last year it was the ‘Total Warrior’ in August, and indeed, we are doing that again soon. 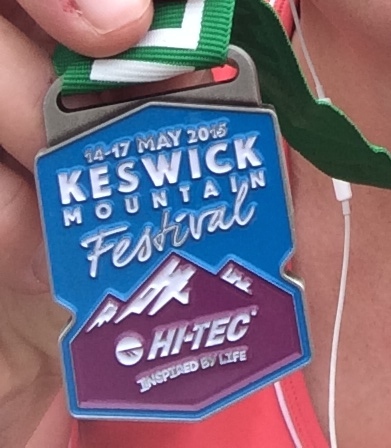 This year, I started the year training for the Keswick Mountain Festival 10km trail run. My training wasn’t really as good as it should have been, but at least I did enough to complete the race. quickly you can build up from running for just a minute and a half to a full half an hour. 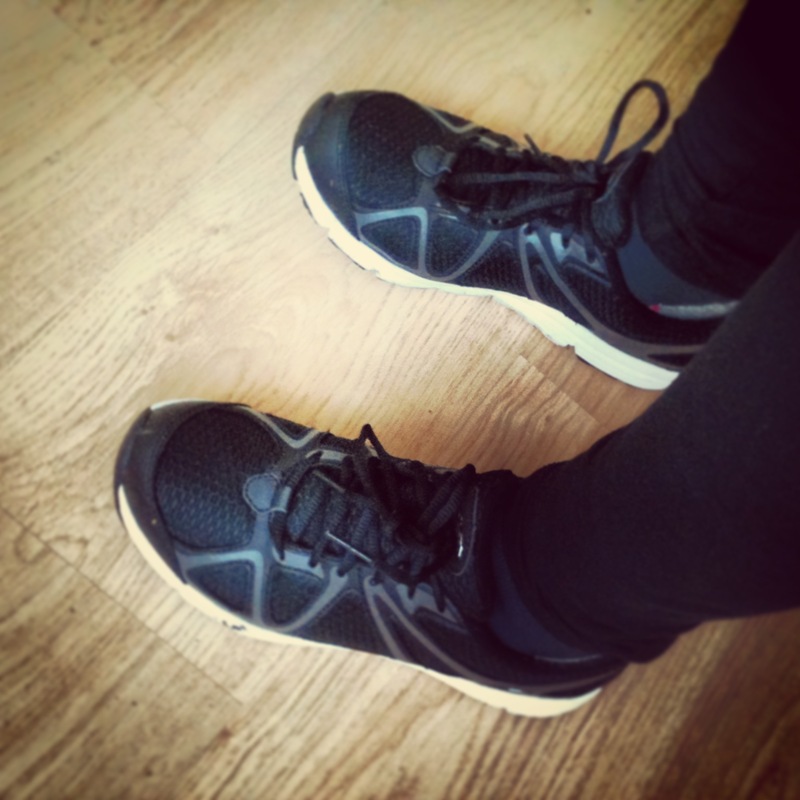 You don’t need expensive shoes – mine cost about £14 and I’ve been wearing them for over a year with no problem. The one thing I would invest in is a decent bra – it will make a massive difference to you comfort. I like the ‘Shock Absorber’ brand, which I’ve recently seen for sale in Go Outdoors. 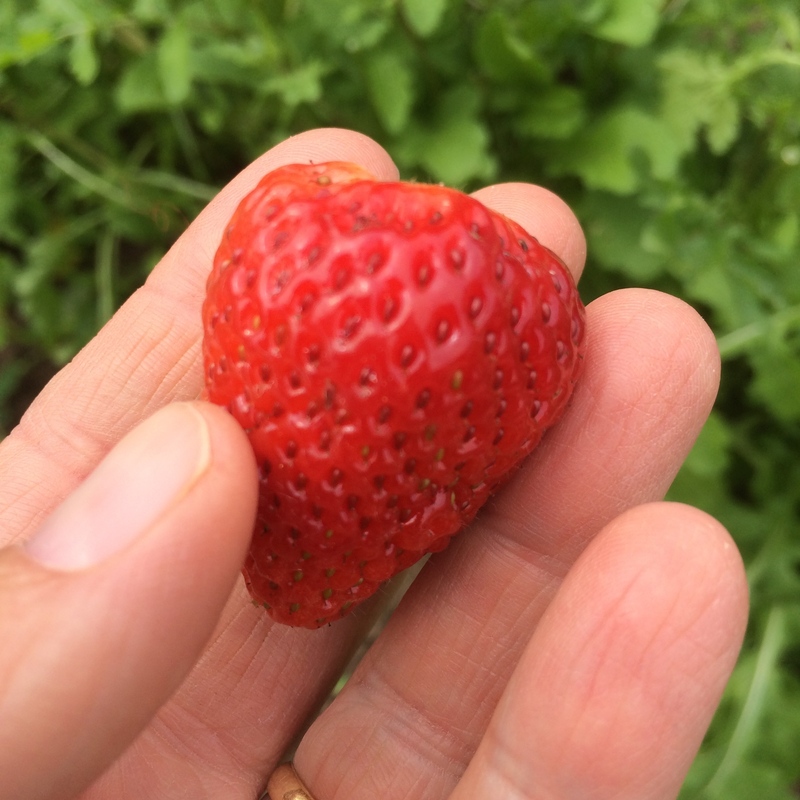 My first strawberry of the summer. It’s never long before I have more strawberries than I can easily cope with. In the last week I have picked about 6kg from our badly overgrown strawberry patch. They grow despite me, not because of me. I have no idea what variety they are but they don’t keep very well and actually, they don’t have the best flavour when eaten ‘raw’. 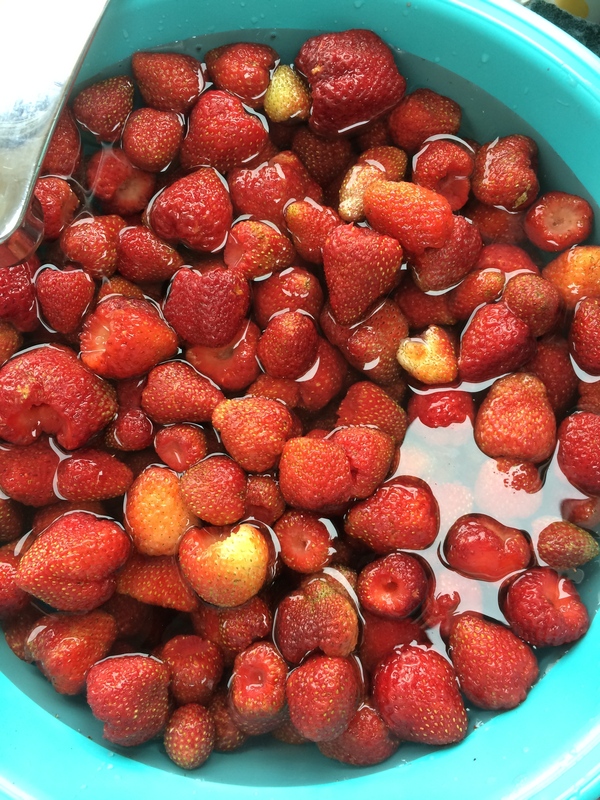 They make good jam though and I have some steeping in sugar ready to make strawberry conserve later today. Last week while the country was enjoying a 30C heatwave was NOT the time for making jam. 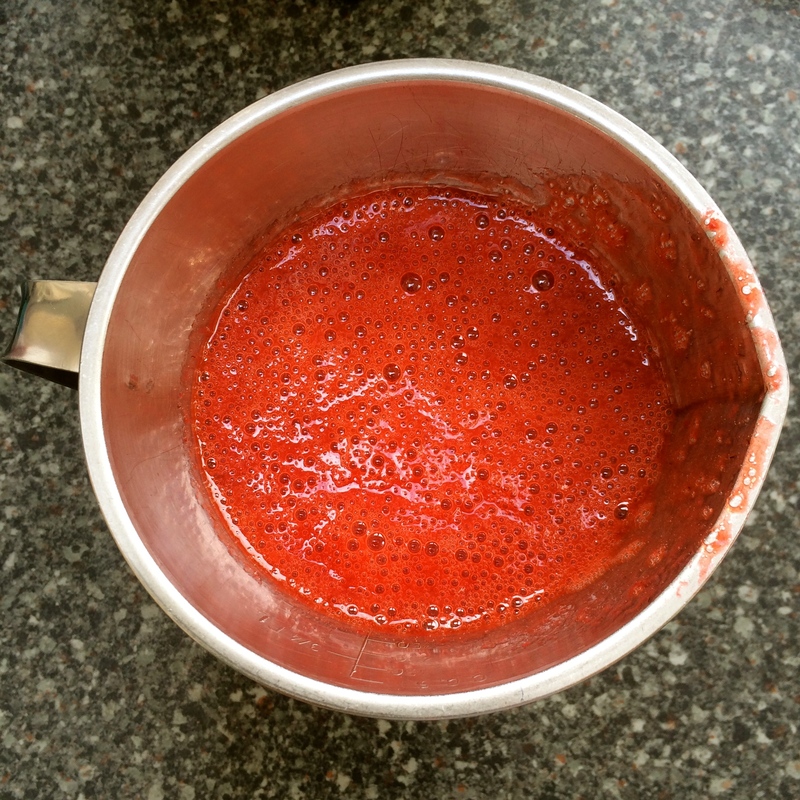 Instead I decided to go back to a recipe I haven’t made for a very long time – Hugh Fearnley-Whittingstall’s strawberry granita. Since I bought a mouli attachment for my Kenwood mixer this recipe has become even easier – no more pressing all the fruit through a sieve. Last time I made this I did as the recipe suggested and froze it all together, serving it by scraping it into piles of red crystals with a fork. 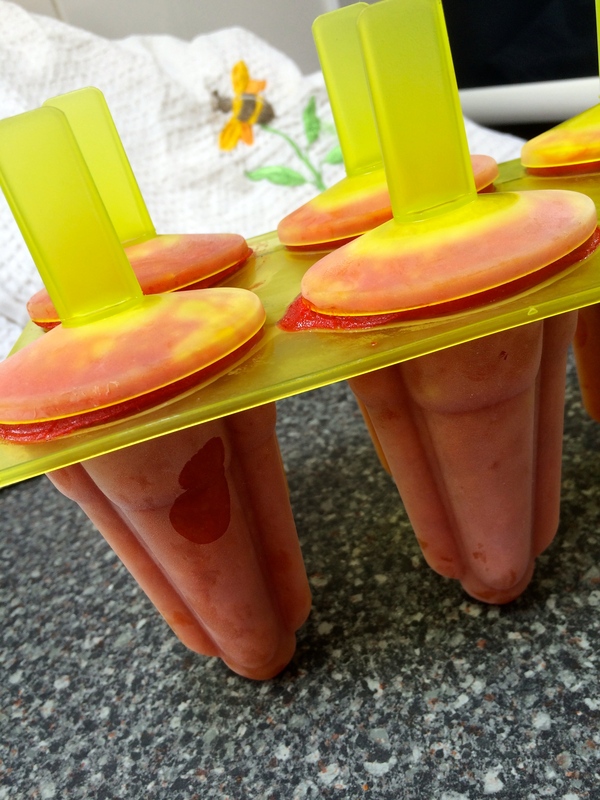 That got a bit tedious after a while though so this time I froze the mixture into ice lolly moulds and the first batch has disappeared already. Here is what to do. Mash and sieve (or put in your mouli) 1kg of hulled strawberries. Mix in 200g of icing sugar and the juice of a lemon. That’s it. Just freeze the mixture in whichever way you prefer. Of course, you then have the challenge of getting the lollies OUT of the moulds. I’ve been dipping mine, briefly, into a cup of boiling water and then squashing them gently. That seems to have worked. Today I made a second batch of this mixture. 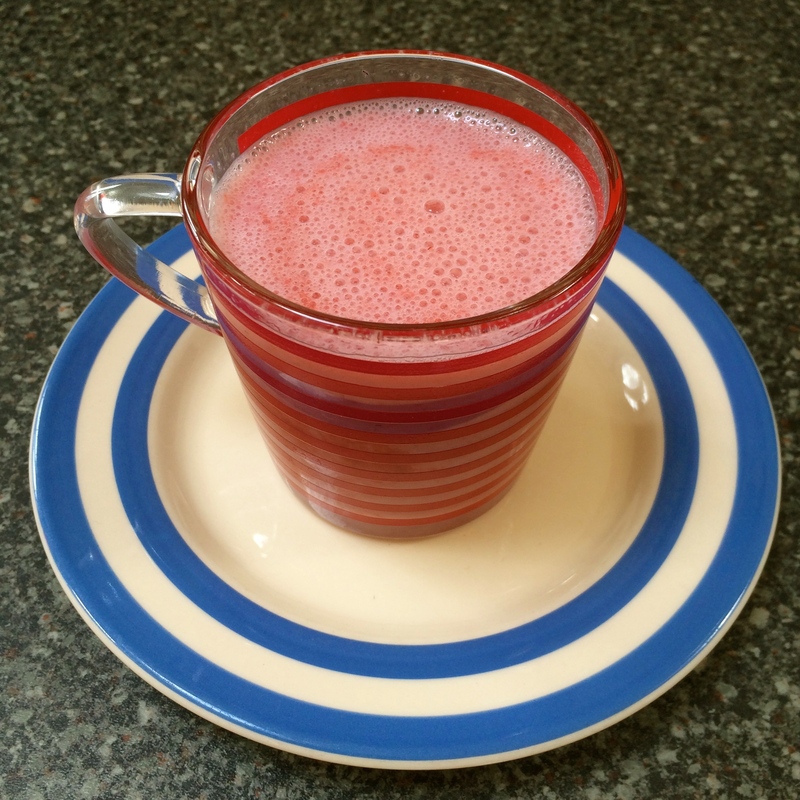 Despite buying a second set of lolly moulds I still had a bit of strawberry juice left over. It made an awesome milkshake. Just what the doctor ordered for my littlest person who is at home with a raging temperature. Since strawberries are very high in vitamin C it might just help to fight off whatever virus is bugging him. 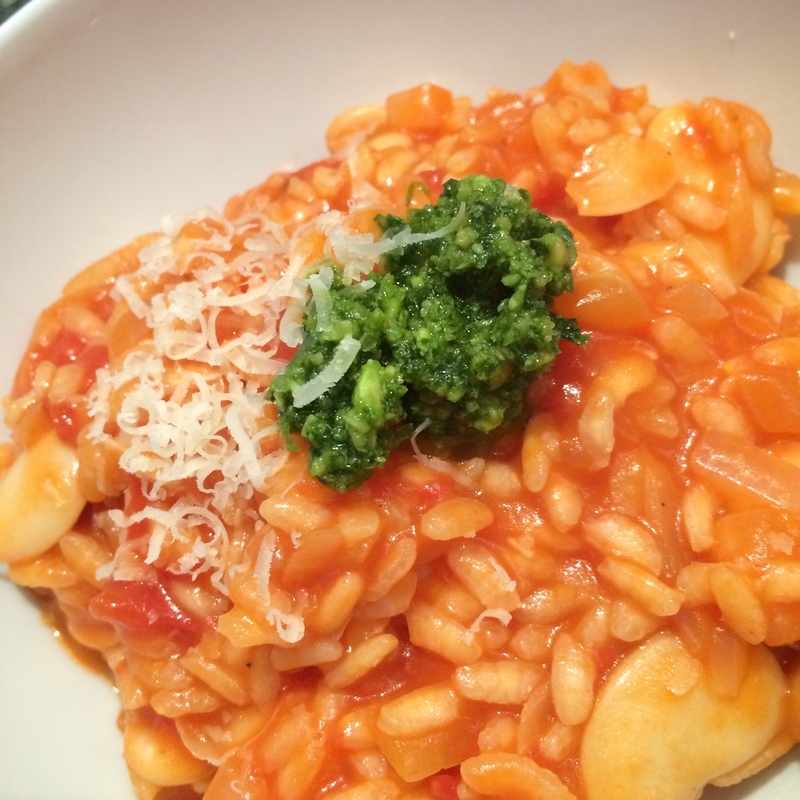 Cheap Dinners: Tomato Risotto with Butter Beans. Lately I’ve been feeling less and less like eating meat. I haven’t given up eating it but I just don’t feel inspired by cooking meat dishes. I also find that if I need a quick meal, meat is not my friend. I tend to buy meat cuts that are better cooked long and slow, because they are cheap. I rarely have chicken breasts in my fridge or freezer. However, I ALWAYS have tinned tomatoes, rice and usually some sort of tinned bean. Together they can be combined into a simple, nutricious supper. Gently fry the chopped onions and garlic in the oil and butter until soft. 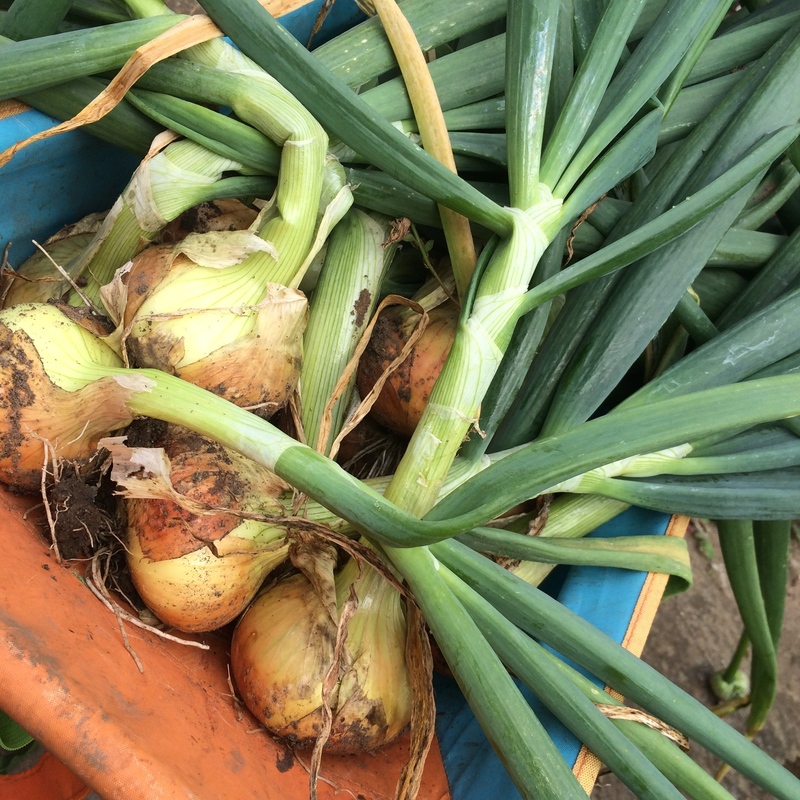 It’s very important to do this well because you don’t want hard, sharp tasting onions in the final dish. Add the rice and mix well. 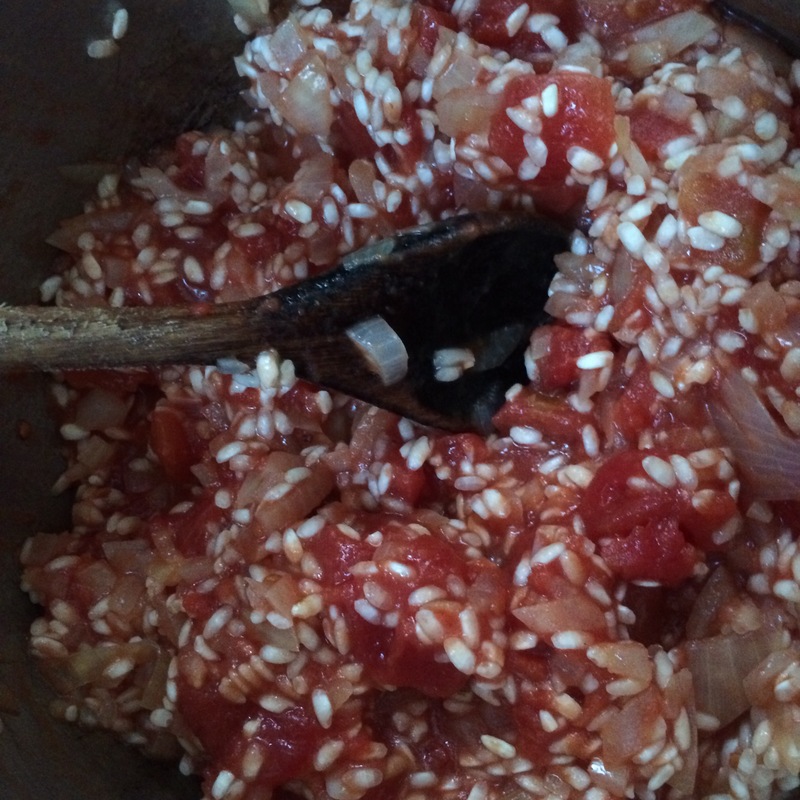 Fry the rice for a few minutes and then add the chopped tomatoes a splash of boiling water and a tablespoon of tomato purée. Allow the mixture to simmer and stir frequently or it will stick. You may need to keep adding a little more boiling water. When the rice is cooked it should be soft and without ‘bite’. Stir in the beans and allow them to heat. Season with salt and pepper. I garnished mine with a little grated parmesan and a small blob of wild garlic pesto but basil pesto would be nice too. 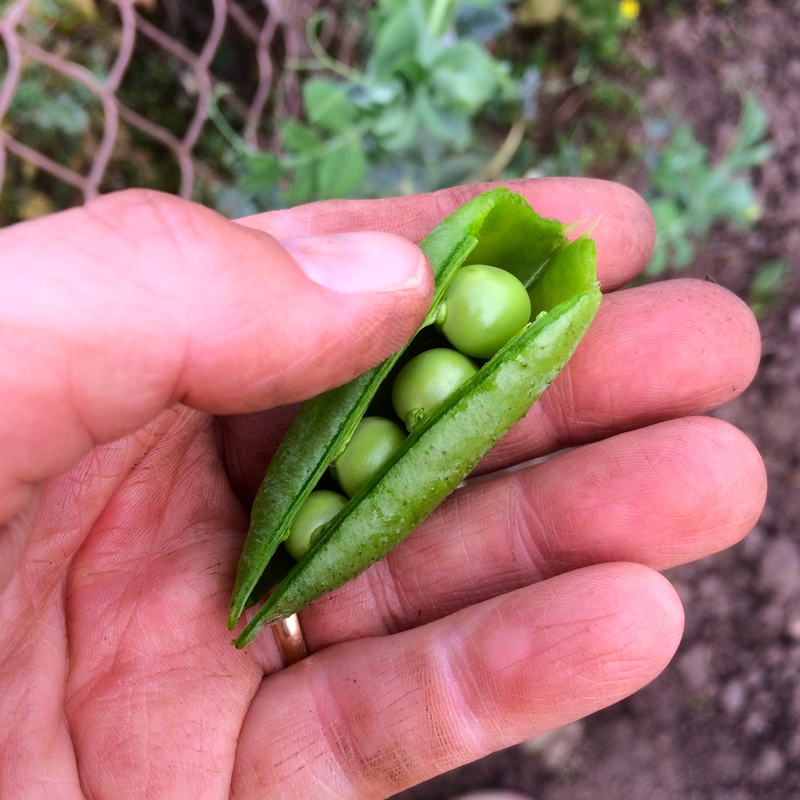 There are a million ways you could change this recipe – more onions, different beans, some herbs, diced chopped vegetables, a few frozen peas or sweetcorn. In it’s most simple form it is cheap, cheerful, tasty and nutritious – I’m sure I heard someone once say that all the amino acids a person needs can be found in a combination of rice and beans. So, if you’re stuck for a quick meal, this could be just the thing. It’s the time of year to reflect and to plan. 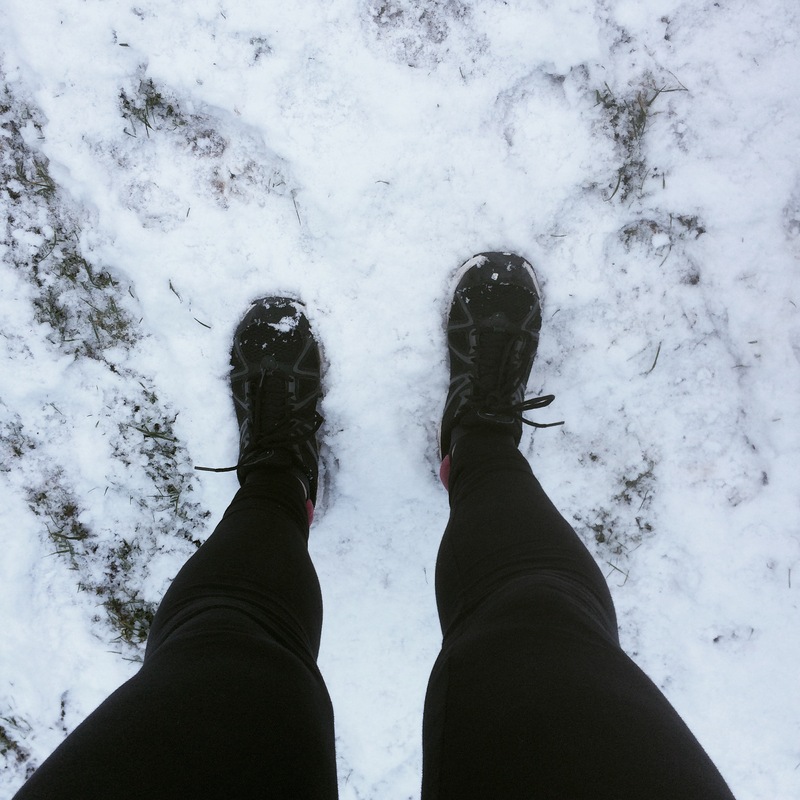 I know I am a bit late with this, as it’s the start of February but I have lost my blogging mojo a bit. I made a serious error at the end of last year and deleted all the photos from my blog. I’m slowly trying to add them again but it takes time and it’s thrown me a bit. If you go to older posts, all of the photos are gone. I almost decided to give up on this project but I have lots of happy memories stored here. It’ll take time but I’ll get everything sorted out eventually. I started training last January and progressed really well. I wouldn’t say that I am a committed and converted runner but it was satisfying to see how quickly I could build up my distance. 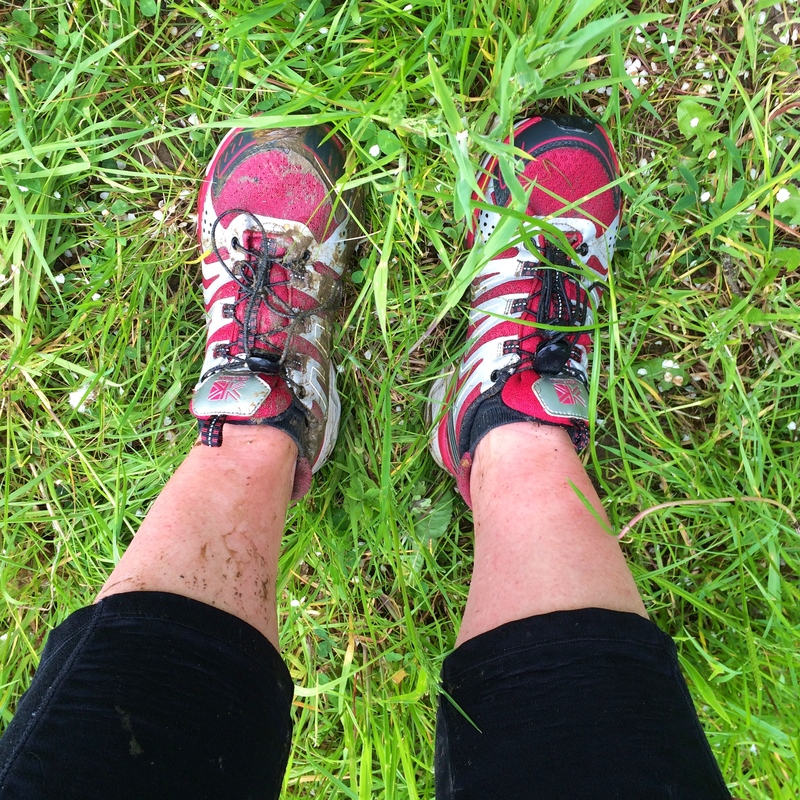 Ultimately I completed my goal – the 10km ‘Total Warrior’ course that my husband had done the year before. I am back in training because I want to do it again. I also want to do the Great North Run, if I can get a place. After stocking up at the inaugural Yarndale in September 2013, I had a fabulous stash of yarn. Some of it really, really needed to be worked with needles, not a hook. 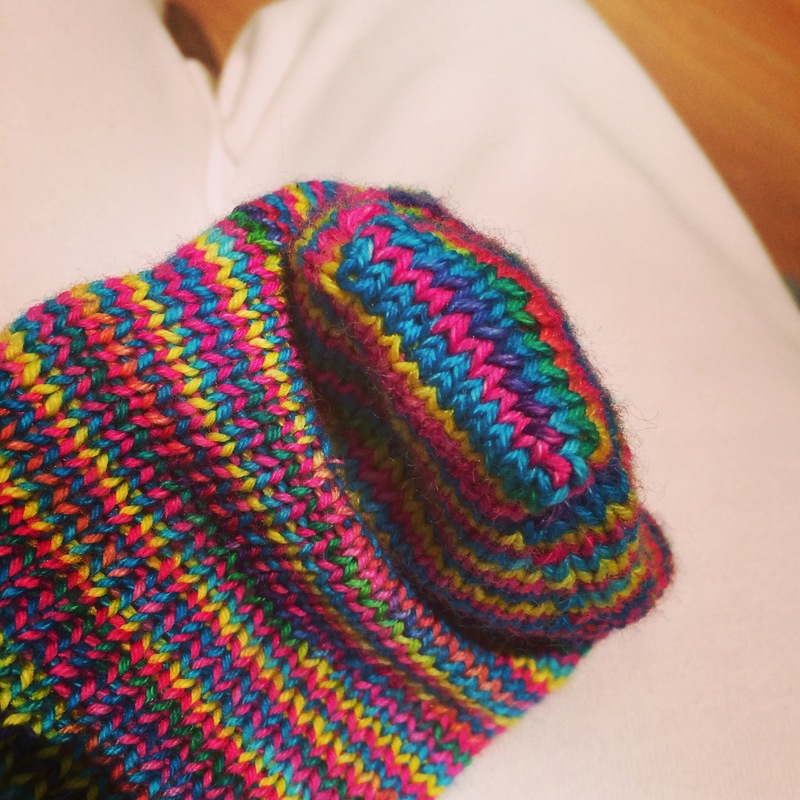 I started my knitting adventures this year by casting on my first pair of socks. It did NOT go well to start with. This picture is actually the second sock, which I managed without my Mum, unlike the first one. 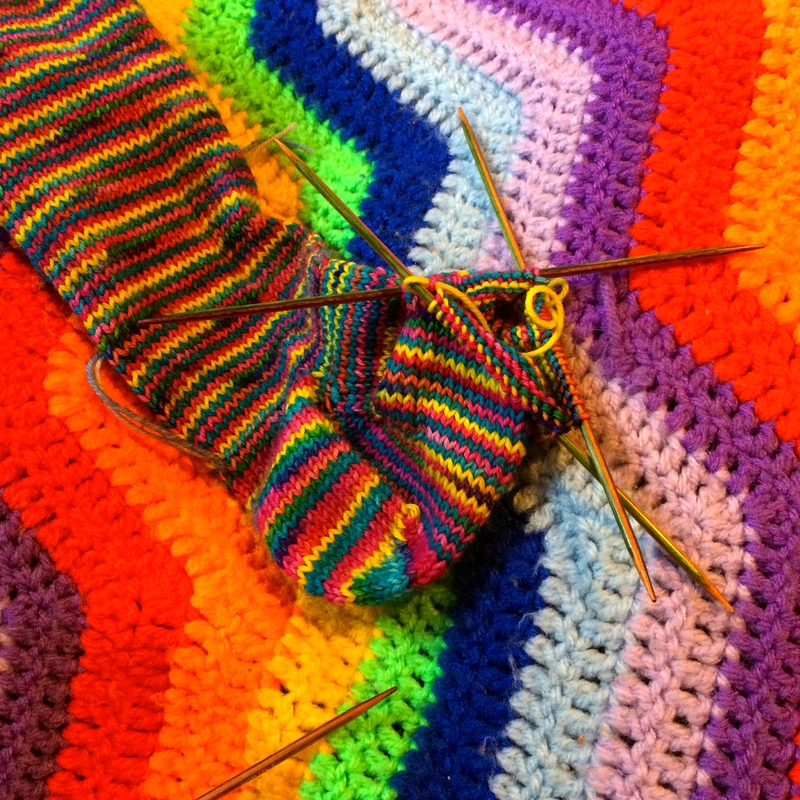 Once I got the hang of holding the needles I began to LOVE sock knitting. Just going round and round doing plain old knit stitch is quite mesmerising. I found that working in variegated yarn was very helpful as a beginner. It’s much easier to identify and put mistakes right when each row is a different colour. 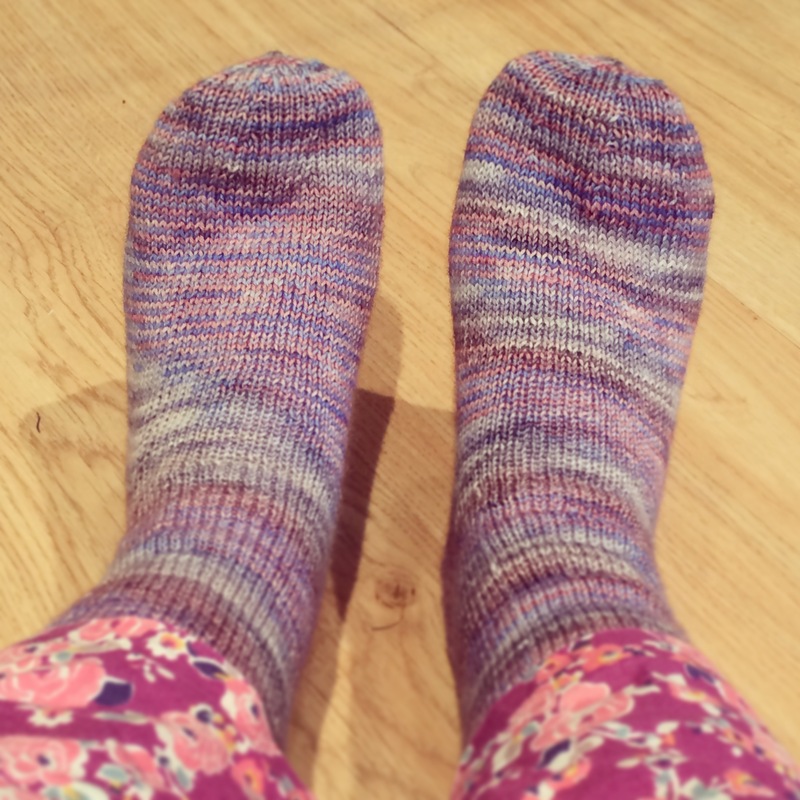 My first socks were done in a non-traditional way with an ‘afterthought’ heel which was also knitted ’round and round’ and a toe done in a similar way. I had no idea how to pick up the stitches for the heel but I found a YouTube tutorial and away I went. 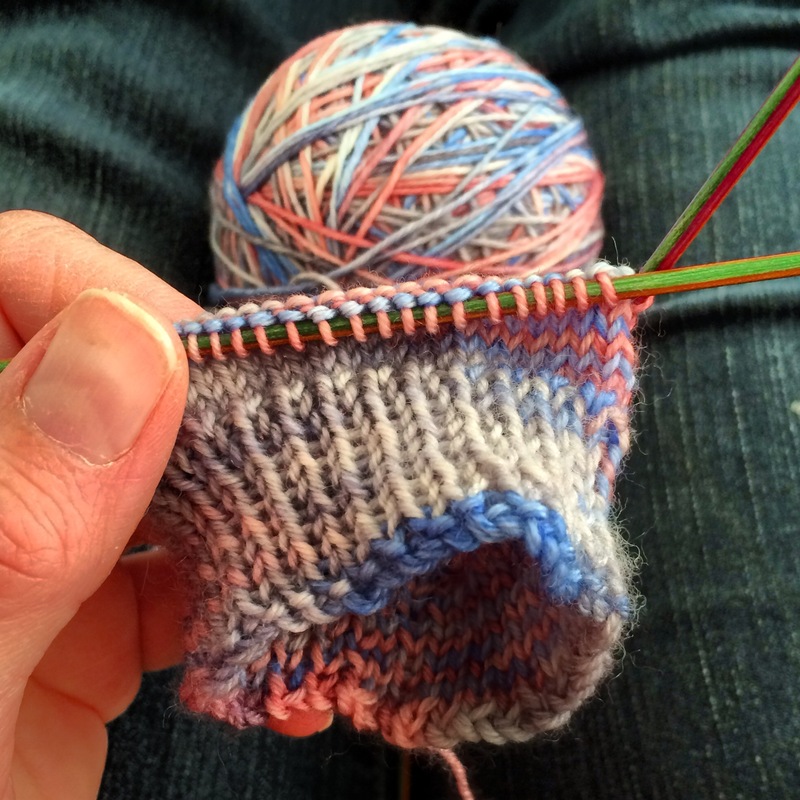 When it comes to learning new knitting skills, Google and YouTube are your friends. I was ridiculously pleased with my first pair of socks and cast on pair two, this time in rainbow colours for my daughter. This time I wanted to learn how to turn a heel in the traditional way. I took my socks on holiday with me and put up with much joking about how much it would cost to pay me to make socks. If I was charging by the hour, they’d be very expensive socks. Not only did I ‘turn’ the heel, I also managed to complete the toe with grafting or ‘Kitchener stitch’, thanks to this tutorial by Sarah, over at Continuum Mama. Sarah also helped me learn another skill this year. She kindly gave me a live tutorial via Skype in which I learned the basics of intarsia. In other words, I learned to change the colour of my yarn and knit a coloured pattern. 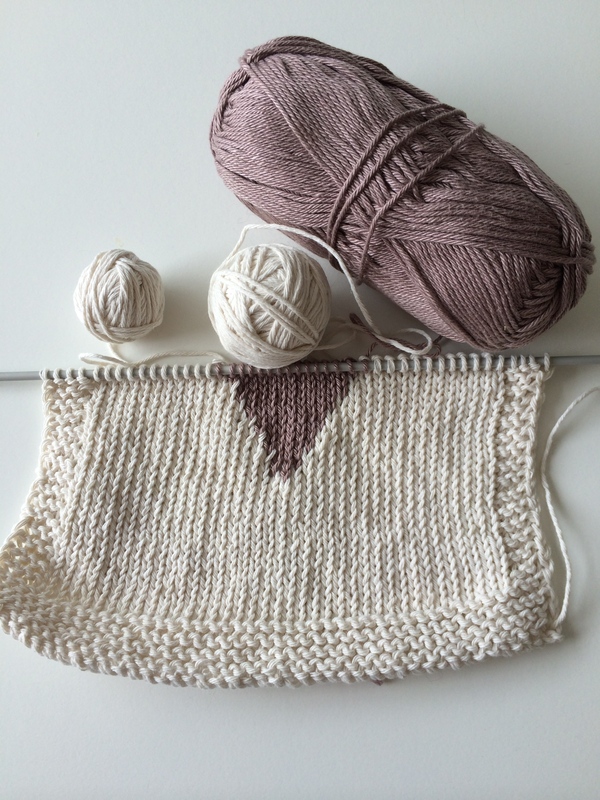 She choose a simple heart pattern centred into a wash cloth. It was a great first project and made a cute little birthday present for my great aunt. Spurred on by the success of these projects my current WIP combines sock knitting and intarsia. I’m not going to share it yet though as it is going to be another gift. 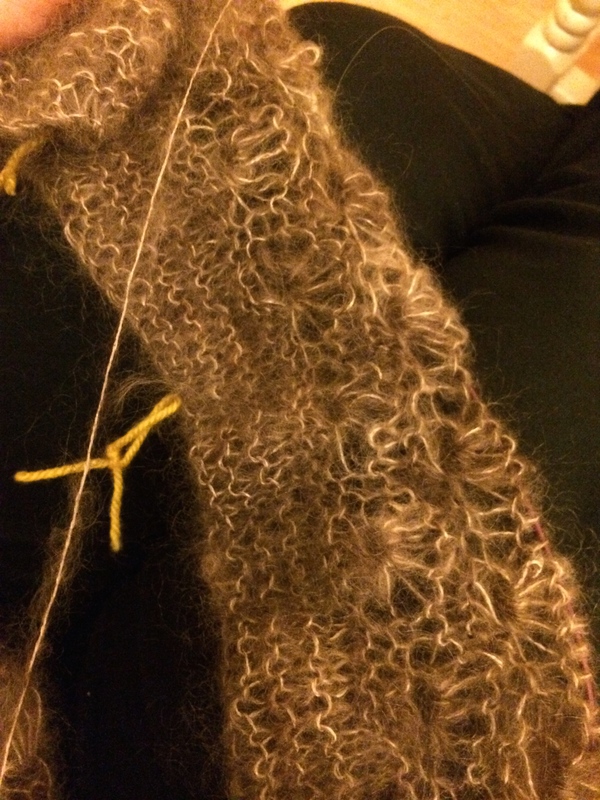 One of my more expensive purchases at Yarndale was some fluffy, fine kid mohair from Northumbrian producers, Whistlebare. I really only bought the yarn because I loved the free scarf pattern that came with it. 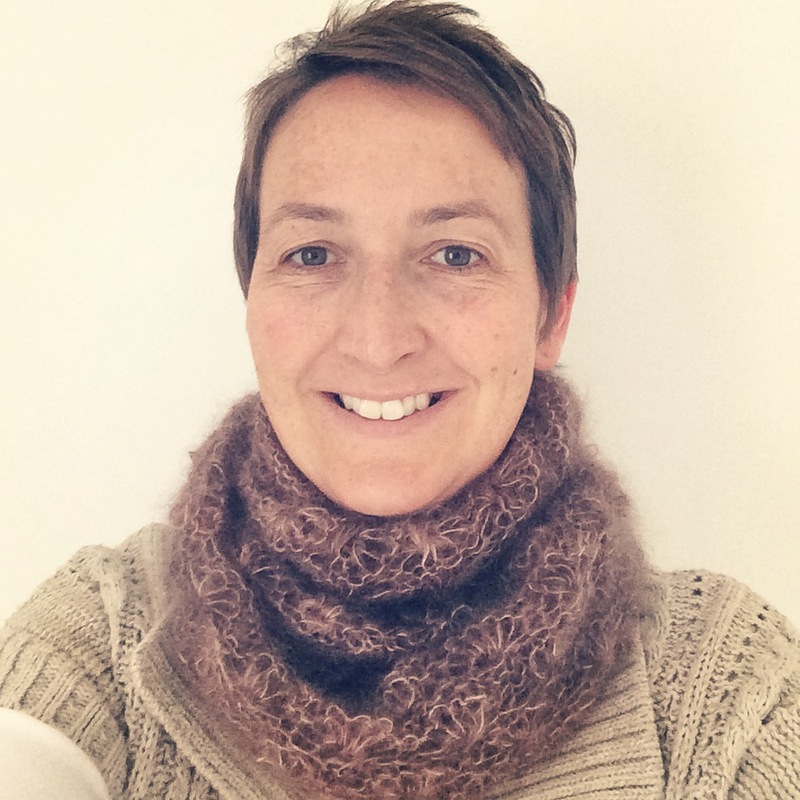 I wasn’t at all sure that I would ever be able to knit it as another new skill was required (using a circular needle) and the pattern clearly stated that it was not for beginners. I eventually plucked up the courage to cast on the required 216 stitches, carefully marking every 20 stitches. I did NOT want to start creating the pattern and find I had cast on the wrong number. Creating the ‘daisy’ pattern was a challenge. I couldn’t make any sense of the pattern and neither could my local knitting friends. Of course the great thing about the internet and dealing with small producers is that a couple of emails later, all my questions were answered by the pattern designer herself. 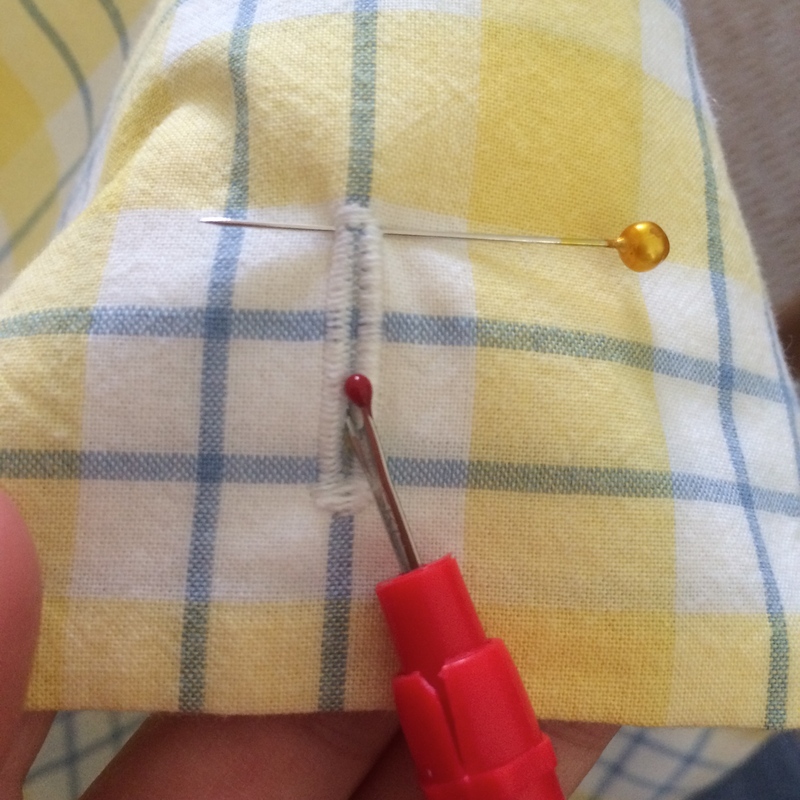 My Mum has always sewed, on and off, and it’s something I’ve always felt I should be able to do. I got put off as a child because my Mum’s sewing machine was very temperamental. I usually ended up jamming it up in great twists of thread that had to be hacked at and fought from the teeth of the machine. Now she has a much easier to use, modern machine that helpfully beeps at you when you do something stupid, like try to sew with the presser foot up. I’ve also realised that I am a person who likes to do things by the book. I like instructions and I like to know that I am doing things the right way. Mum, it turns out, is much more instinctive and learned a lot just by watching her Mum. I do not work that way and am probably a nightmare to teach. Next I hunted in all the local charity shops for the fabric. Call me cheap but I had this idea that an old duvet could be ideal material for pyjama making. 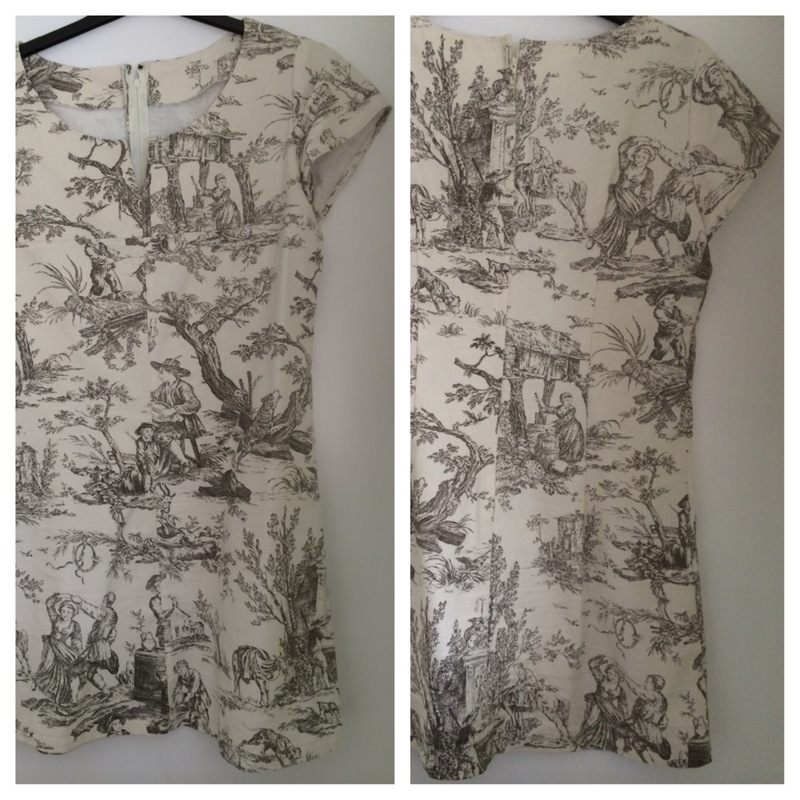 I wanted something soft, simply patterned and mostly cotton. 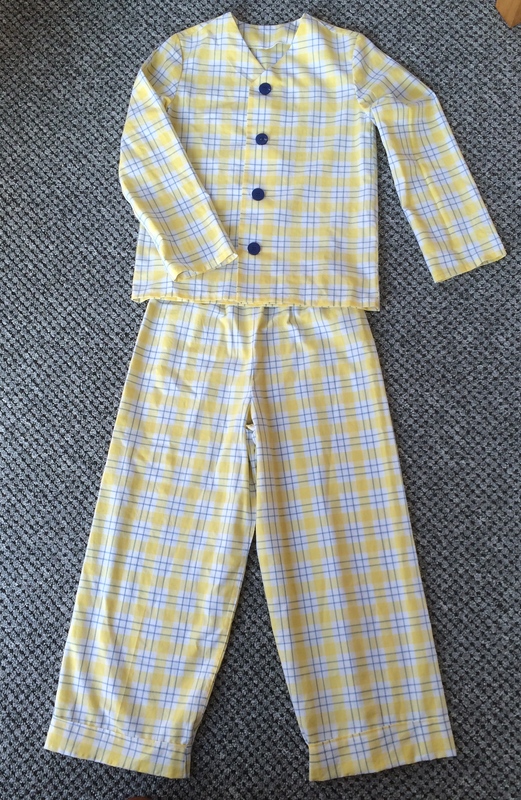 I’m pleased to say that I managed to buy the fabric and make the PJ’s in time for the local show in September. I entered them into the ‘up cycled garment’ class and won first prize! It only took about five months from start to finish! Later in the year I decided to make another garment, also using recycled fabric. The day my Mum and I went to Yarndale, we had a trip around the charity shops of Skipton. Mum was very taken with the print on this curtain and promptly bought it. 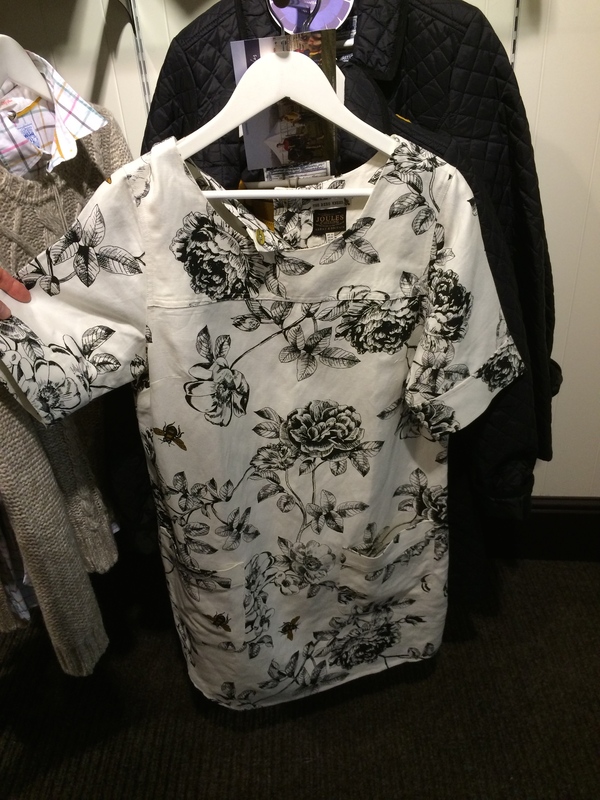 We then spotted this tunic in Joules and thought we could make something similar. It turned out well but I must admit I haven’t worn it much yet. I need something to put under it for winter and I haven’t found a top the right colour yet. I’m pretty pleased with how my sewing skills have come on this year. I think the most important thing I learned was that if you don’t measure yourself carefully you will probably make the wrong size. 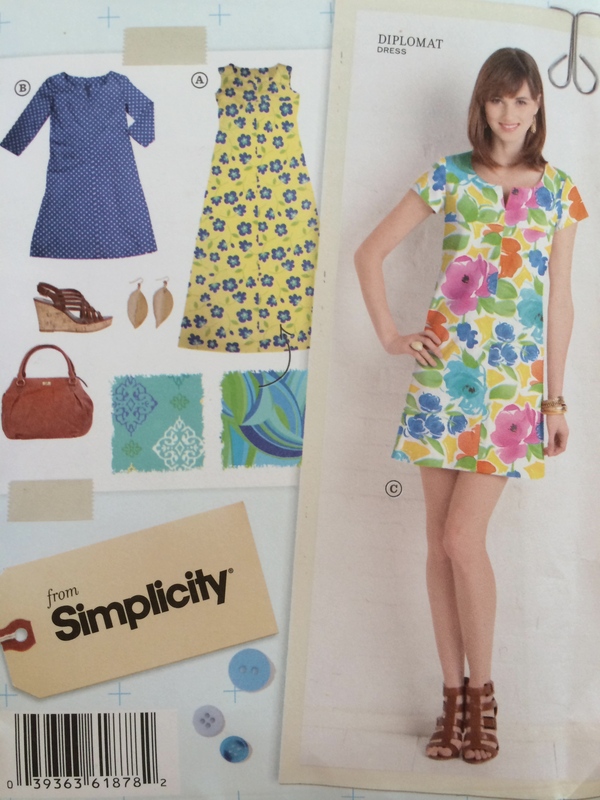 I generally wear a UK size 12 when I buy from the shops but I think I ended up making the size 16 on this pattern. 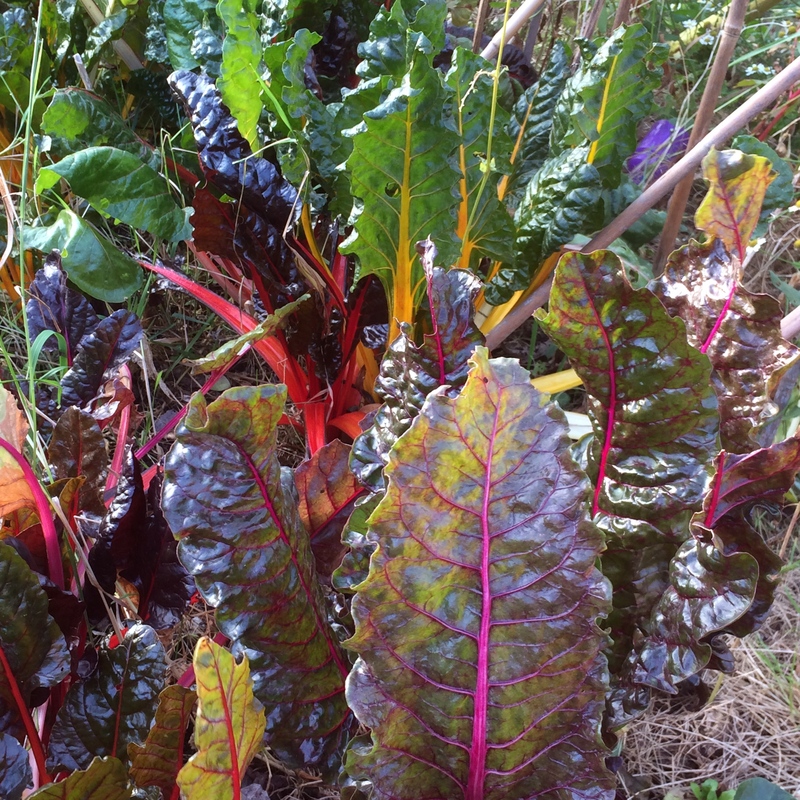 My final aim for 2014 was to get into the allotment more and grow more of out own food. I don’t think I did a spectacular job of that. My biggest failing is letting pests get out of control. I’m not keen on slug pellets so I need to find another way to get rid of these beasties. 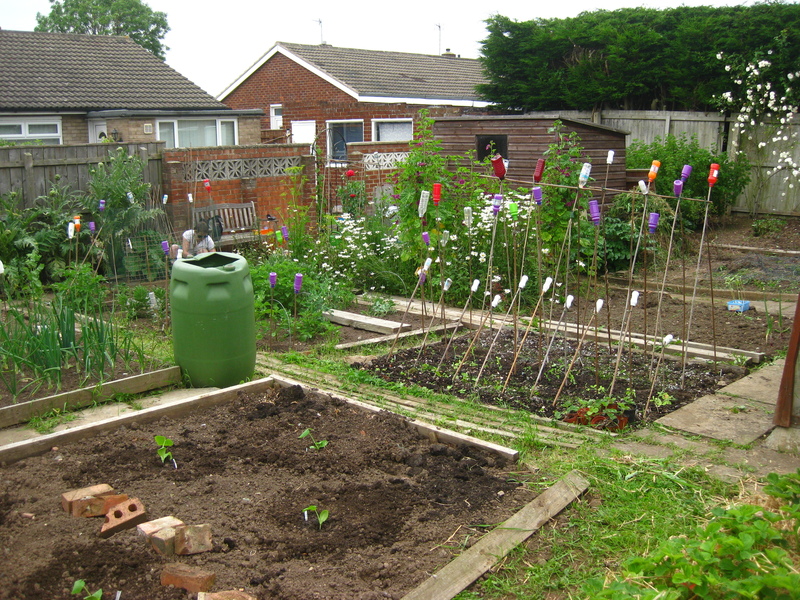 The things that did the best were the usual suspects: onions, courgettes, pumpkins, strawberries and gooseberries. 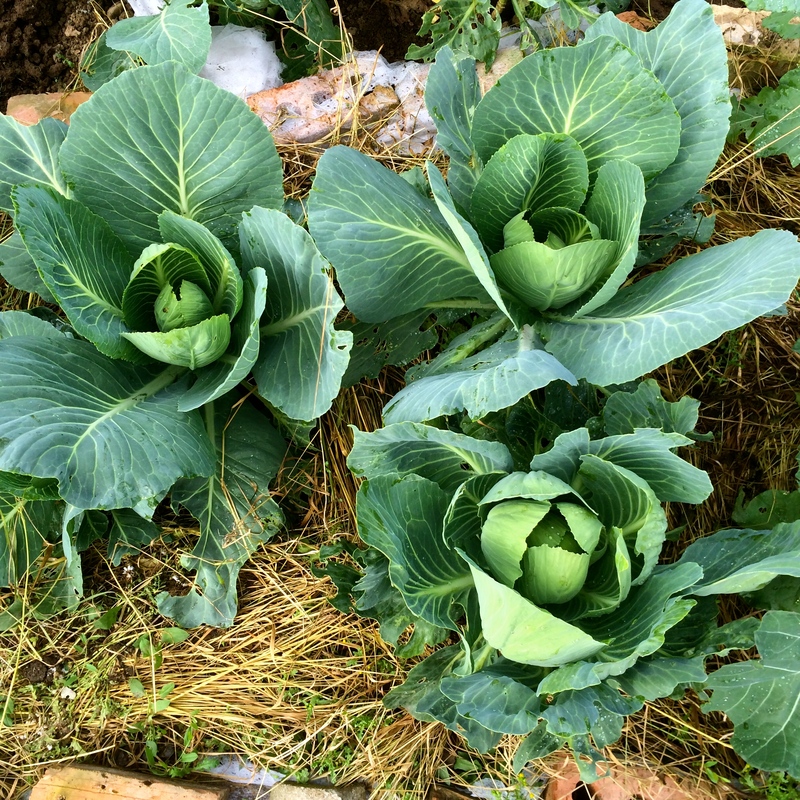 My cabbages and broccoli survived but mainly by good luck. 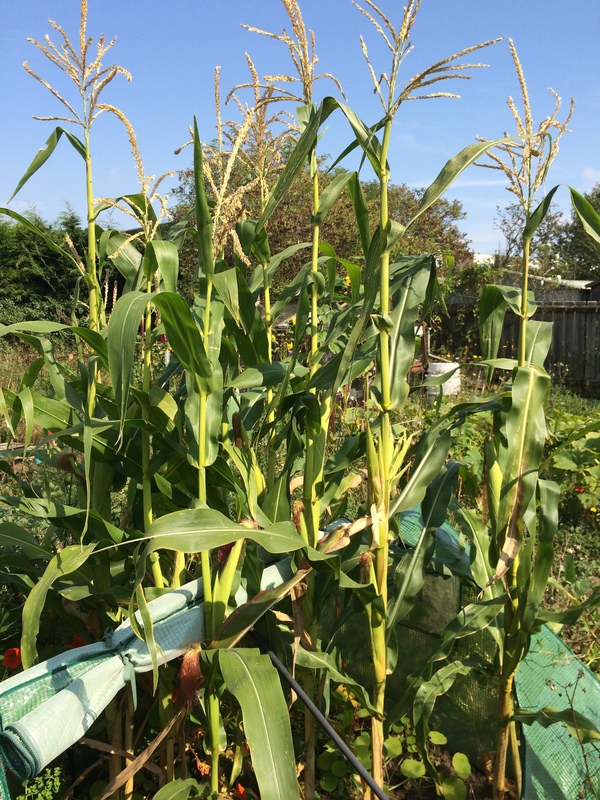 The sweetcorn also grew well and produced cobs of corn but I couldn’t seem to harvest them at the right moment – they were either under or over ripe. I’m hoping that some of them might still be useable for popcorn. 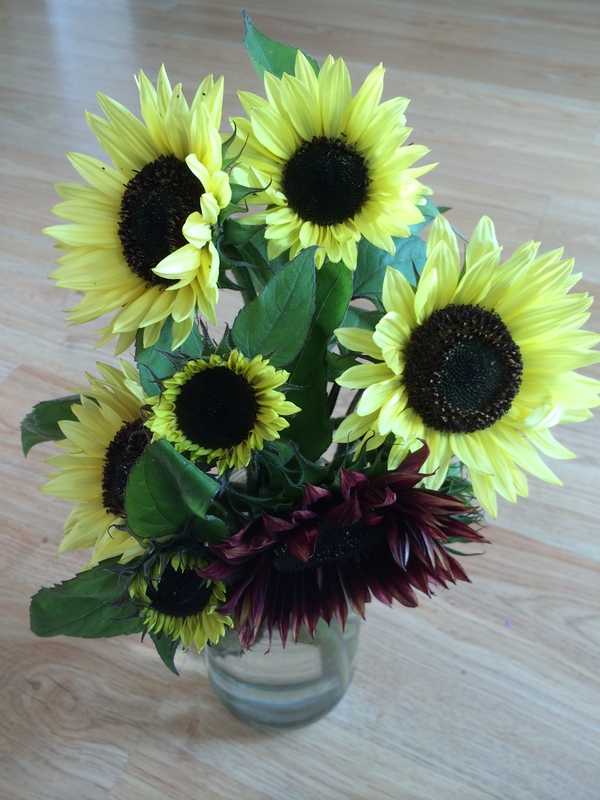 This year I’m going to try and produce more flowers. 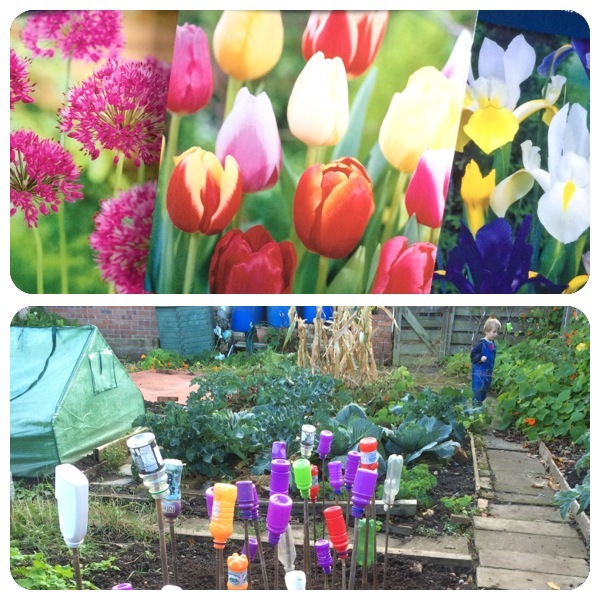 I really enjoyed having a few homegrown blooms at home last season so I have planted a few rows of alium, tulip and iris bulbs though at the moment it looks more like I am growing canes with bottles on top. 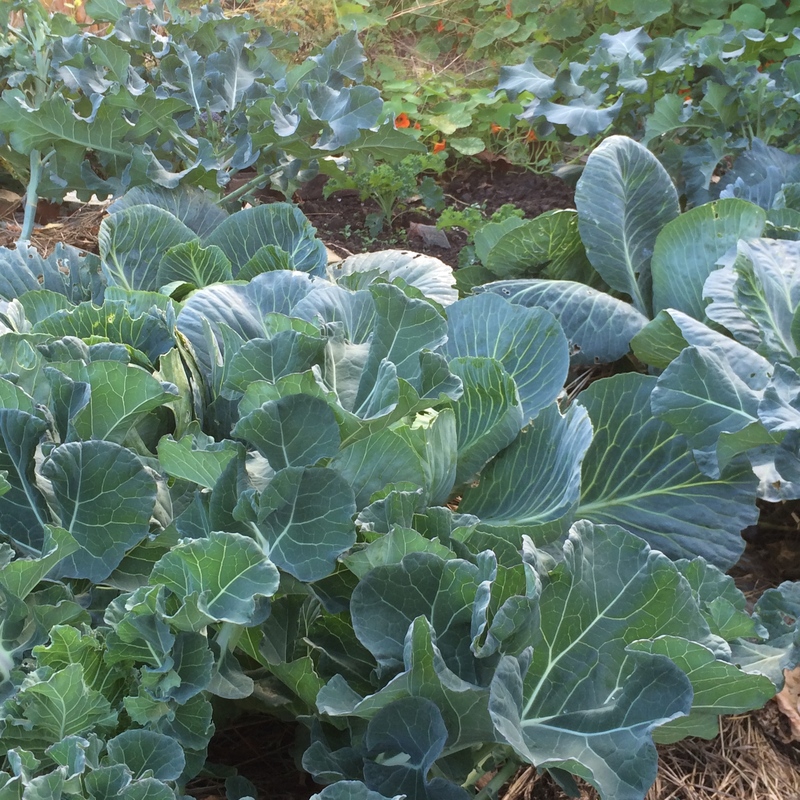 It seems unbelievable that it will soon be time to start sowing and growing again. The months and years tick around so quickly. One month of 2015 has gone already. So, what will 2015 hold? More of the same I hope. My training runs are well under way, I’ve got a special intarsia project on my knitting needles, I’m sure more pyjamas will be required soon and I’ll have to check my seed stocks before long. I hope your 2015 is going well so far and your New Year Resolutions have lasted into February. 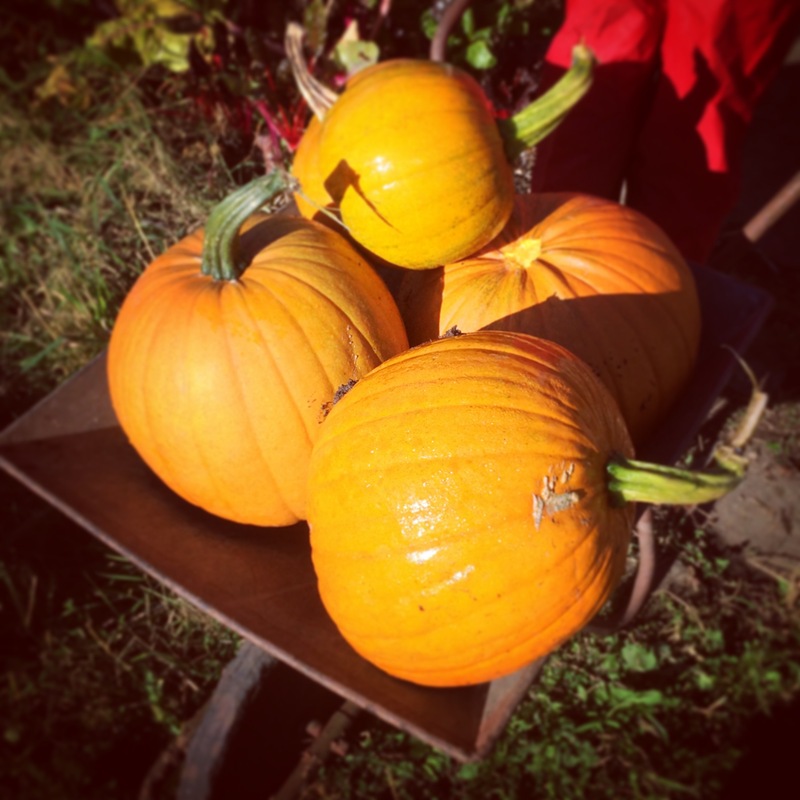 I don’t really want to harvest all my pumpkins too soon, I want to have a few left for Halloween but they are ripening up thick and fast in this warm, early autumn weather. I roasted most of the last one and made some soup (based on this one but with added lentils) but quite a lot of that is still in the freezer. 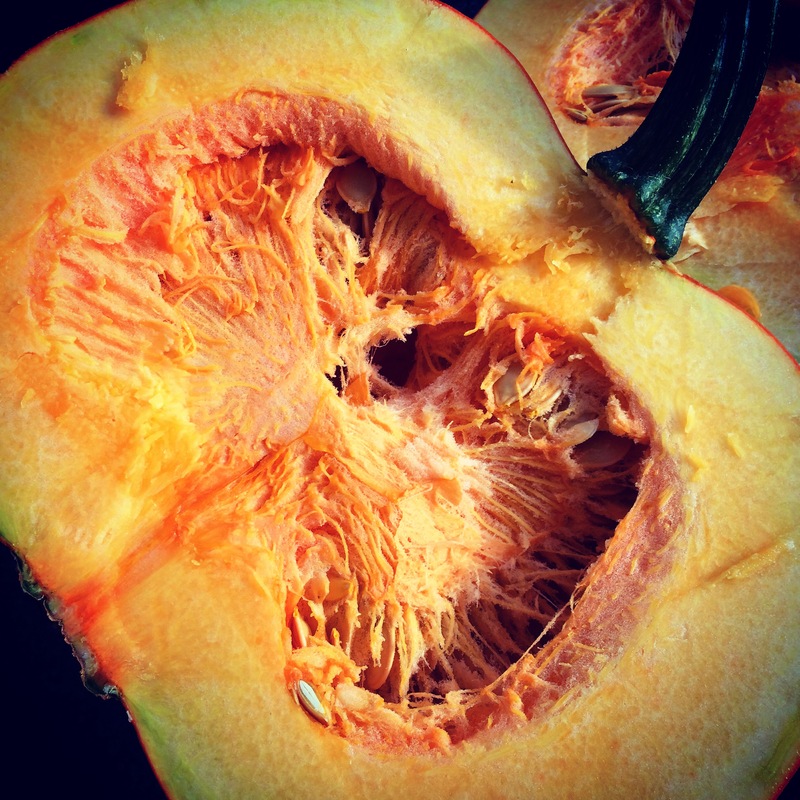 The second of our eight fruits came home at the weekend and it was about the same size as the first – 7kg! 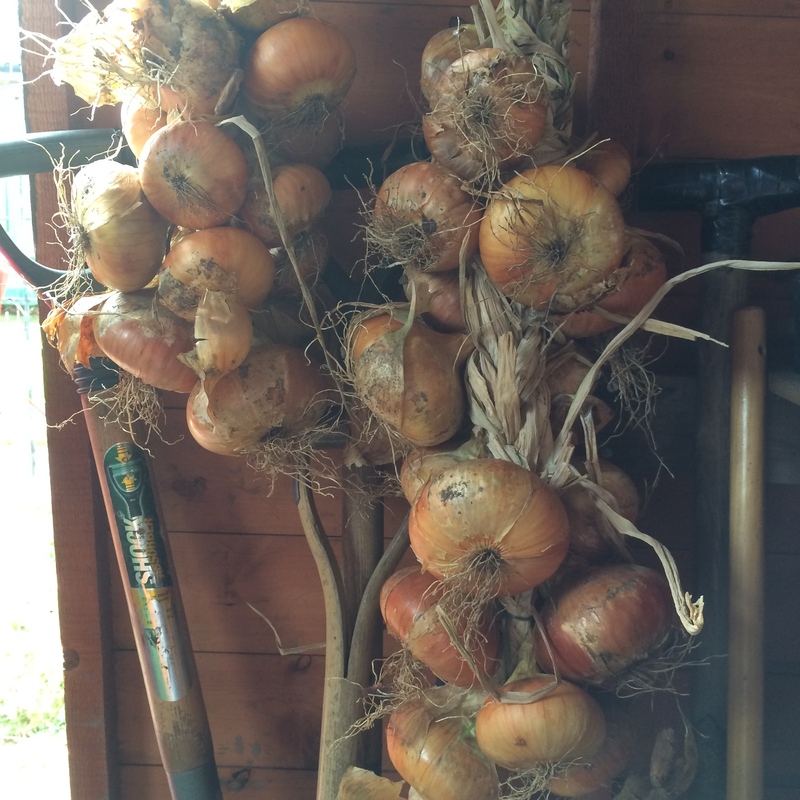 Time to make some chutney. It’s two years since we had a major chutney making session. 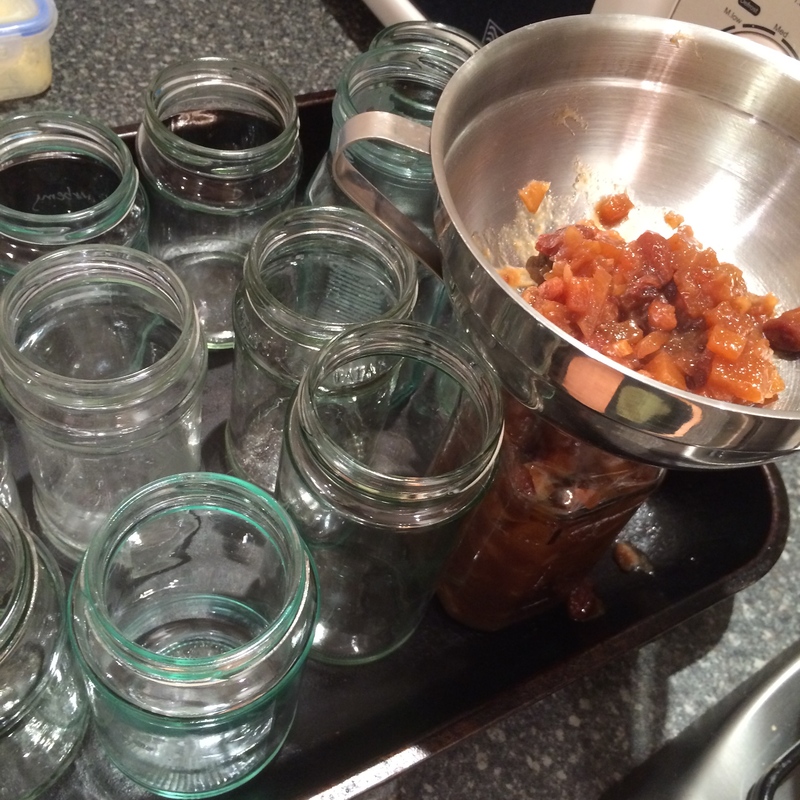 I don’t know how many jars we made but we’ve been eating my favourite dark, sticky rhubarb chutney ever since. I’ve adapted the recipe to use up some of my pumpkin. It seems to have worked well but I can’t promise that it is perfect because you can’t really test a chutney until it’s matured for month or two. 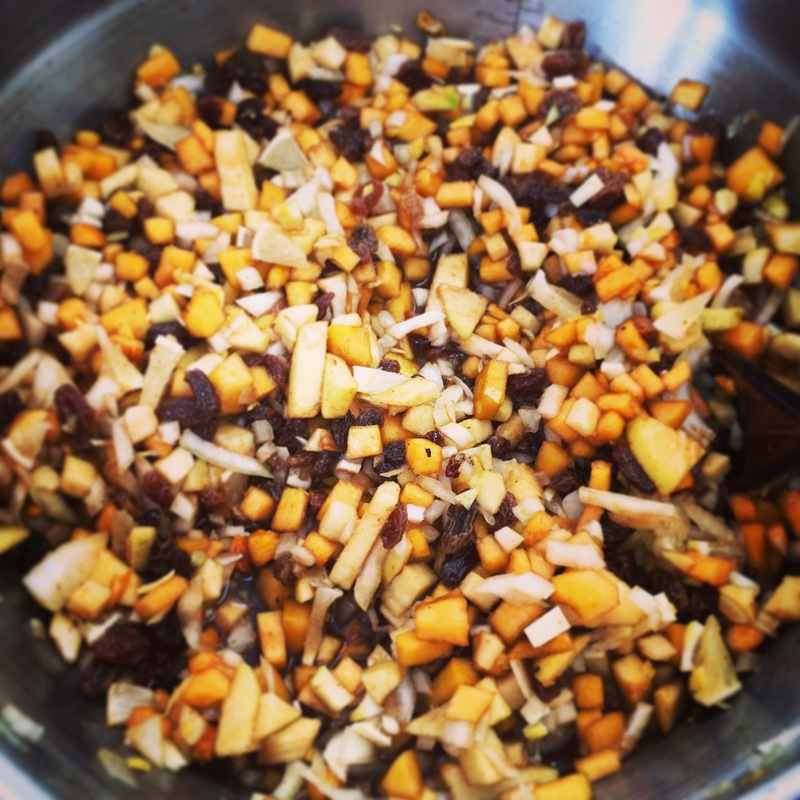 The most time consuming part of making chutney is the chopping up. It can’t really be avoided though and unless you particularly want chunky chutney, you have to spend the time finely dicing your fruit and vegetables. The pumpkin seems to hold it’s shape surprisingly well, considering how easy it is to mash when it is steamed. The picture below is the ‘before’. 700ml white wine or cider vinegar. 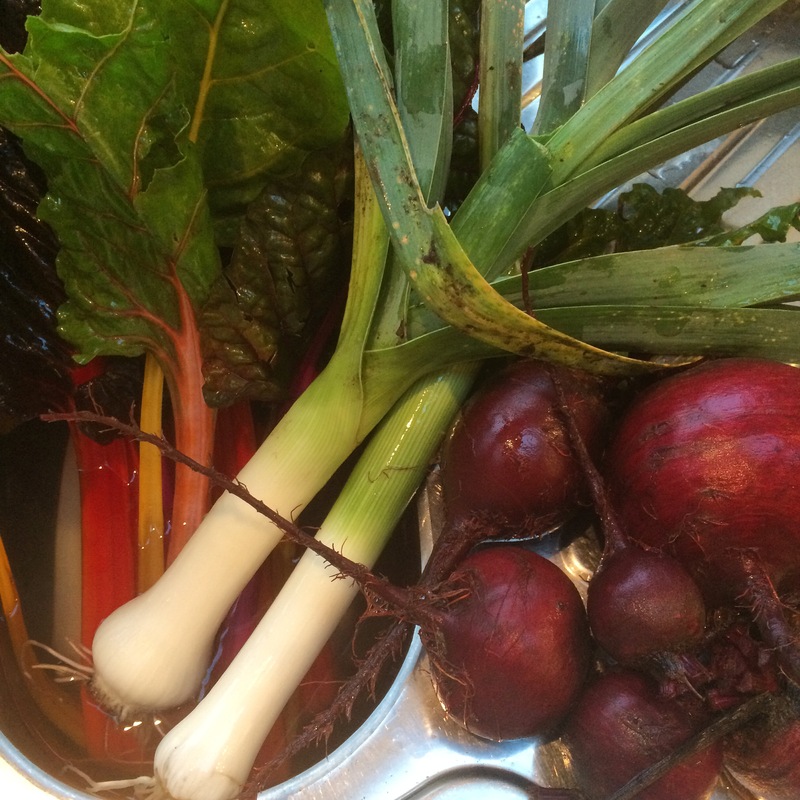 Put all the ingredients into a large preserving pan and heat gently. Continue to cook, allowing the mixture to bubble gently until the liquid has reduced significantly. This will take a couple of hours but you shouldn’t need to give it a lot of attention, just the occasional stir to make sure that nothing is sticking. To test whether the chutney is done, draw a wooden spoon across the bottom of the pan. If the mixture stays parted for a few seconds and you can see the base, it has probably reduced enough. The picture below is the ‘after’ picture. It’s not particularly attractive but it does taste good. When the chutney is almost done, prepare your jars. I always use recycled glass jars which I wash well, stand upright in a roasting tin and put in the oven for about 15 minutes at just over 100C to sterilise them. I also wash the lids, checking that none of them are damaged and then stand them in a pan of boiling water. Fill the hot jars with the warm chutney using a jam funnel, taking care not to get burned! 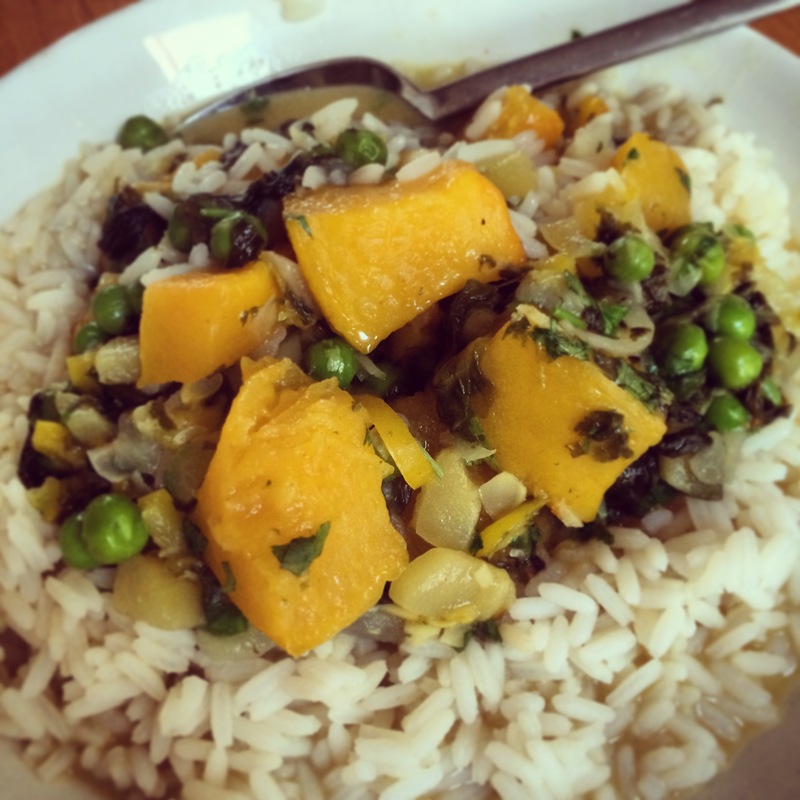 And if you’ve still got lots of pumpkin left, roast some more and make spiced coconut and pumpkin stew.